Miss Blush bodycon mesh side panel formal dress. Stunning dress with paneled mermaid fit, fine straps and very low back with feature side sheer panels to accentuate the waist. Choose this dress for your next formal, black tie, prom or debs and look and feel fabulous in your choice of cobalt or black. Miss Blush bodycon mesh side panel formal dress. 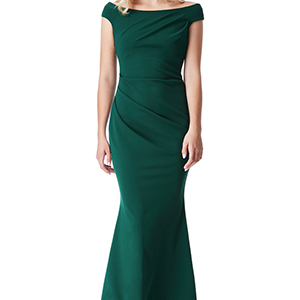 Are you looking for a formal dress with a bodycon snug fit? Then this dress is for you. This dress has paneled vertical sections giving a fabulous fit and look to the hips and rear in an overall mermaid shape. The fine straps support a cupped bust with low v neckline and a very low back. The main feature of the dress is the daring side sheer panels that accentuate the waist. Available in cobalt or black this dress is a perfect pick for your next formal, black tie, prom or debs, just add a glittering bag and accessories.